SALE Starting at $1,349 More Finishes. Same Price. While function is a priority, you won’t have to sacrifice style when you shop home office furniture at Bassett. Find the perfect desk for the job at hand and know that your new office furniture is constructed of the finest materials and made with painstaking attention to detail. Why settle for ready-to-assemble ordinary when you can have distinctive? Choose from a wide variety of hardwoods and finishes, styles and options, each one more interesting than the last. Our Bench*Made line of custom, handcrafted desks are made to your order, one piece at a time, by our artisan furniture makers. 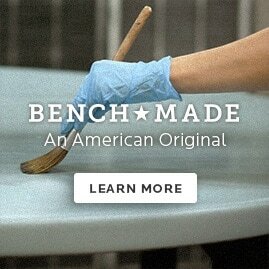 Each Bench*Made furniture piece is assembled and hand finished at our workshop in Bassett, Virginia. There are no assembly lines here. Just artisan craftsmen doing what they do best – creating your next family heirloom. Hand planed, hand sanded and finished, there are no shortcuts. Constructed of solid wood sourced in the Appalachian region of the US, you can have every confidence that you’re buying American. Start by visiting your nearest Bassett showroom and browse through our extensive collection of desks, chairs, and office furniture. Whether you’re looking for office storage or leather furniture for your office waiting room, you’ll find a wide assortment to choose from. If you feel inspired to create your own Bench*Made desk, speak with one of our design consultants. Together, we’ll create desks that make your home office anything but ordinary.